This guide supports the Predatory Publishing workshop on the Lehman College Campus (February 26, 2016). Access the video of the Workshop via the Workshop Tab/Page. Each academic discipline has unique ways of evaluating publications. Therefore, remain active in discipline-specific associations, consult with your departmental chairperson or consider publications where you have previously found excellent articles. Scopus is the largest abstract and citation database of peer-reviewed literature and quality web sources with smart tools to track, analyze, and visualize research. The three different impact metrics are all based on methodologies developed by external bibliometricians and use Scopus as the data source. Via this website, the three journal metrics are provided free of charge. View these screenshots to learn about how to find article metrics in Scopus. The example here is a Lehman Professor's article. View these screenshots to learn about evaluation criteria available through Cabell's. Also, see the demo. These definitions for terms relating to metrics for academic publishing can be viewed via CUNY Graduate Center's Research Guide on Research Metrics. The campaign has been produced with the support of a coalition from across scholarly communications in response to discussions about deceptive publishing. A database of Table of Contents from scholarly journals and provides a single interface to these. QOAM is a market place for scientific and scholarly journals which publish articles in open access. Quality scoring of the journals in QOAM is based on academic crowd sourcing; price information includes institutional licensed pricing. To help identify high-quality journals, JANE now tags journals that are currently indexed in MEDLINE, and open access journals approved by the Directory of Open Access Journals (DOAJ). 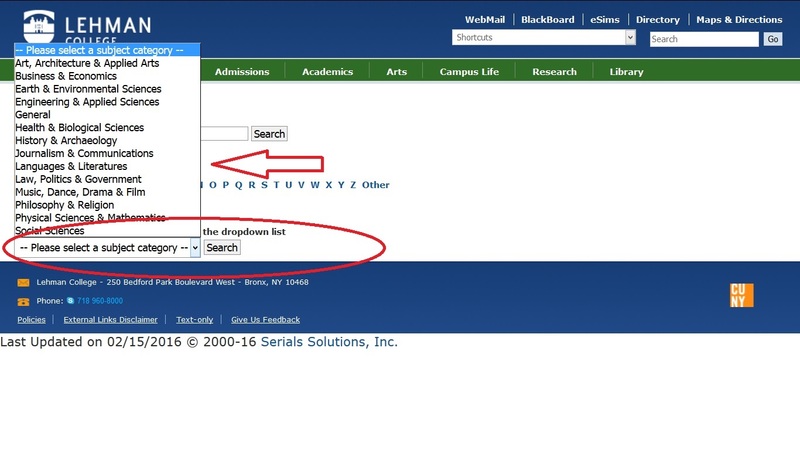 Browse e-journals by subject. Choose a subject category from the dropdown list. Gaining access to full-text journal articles through the Library's databases, search for articles on your topic of interest. Discover journals' subject specialties.